In short: tag size is related to tag popularity (caveat: see below) and edges are related to tag co-occurrences in questions (or more precisely: the observed/expected ratio, see About joint probability divided by the product of the probabilities). Colors are to distinguish graph communities, as detected by this algorithm. For me it looks as a "snapshot" of topics and scope of this SE site. So if you want to use it in any way to promote Math.SE - feel free! Also, if you have comments how to improve its usefulness or niceness to our community, I would appreciate them (but bear in mind that I have no color esthetics). I feel like with this layout you can more clearly see the shape of the connectivity between tags. For example, the arrangement seems to be stretched out along a discrete/continuous spectrum. 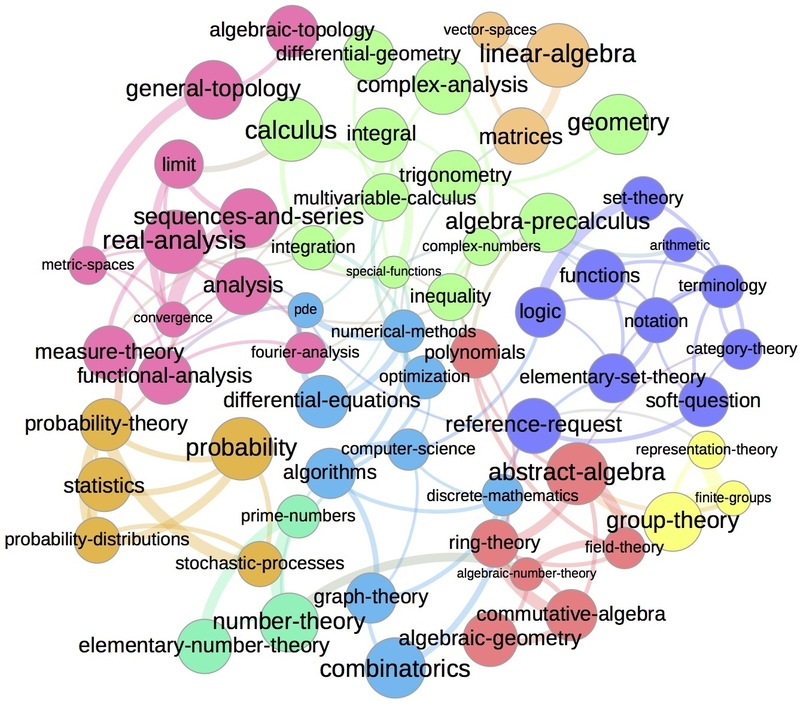 But on the discrete side, there isn't a lot of overlap between the algebraists and the computer-sciencey types. Not the answer you're looking for? Browse other questions tagged discussion tagging community . Would A Word Cloud Based On Tags Be Helpful? 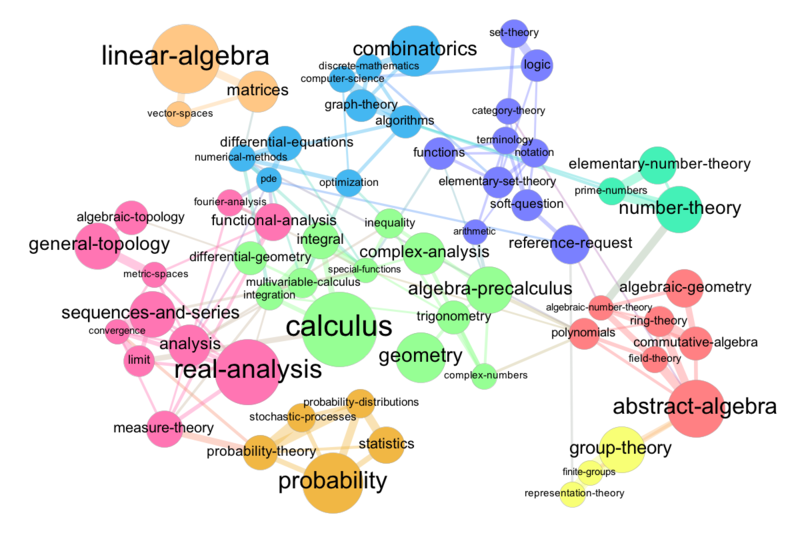 Where should I ask my graph-theoretic questions? 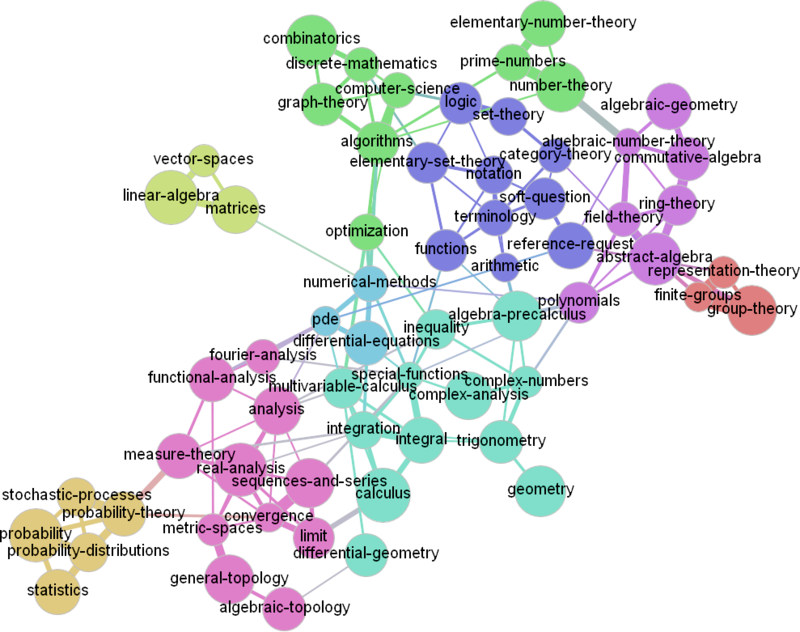 Do questions about 'graph theory' belong here?